Streamline Marketing and Sales Processes with Automation Software software can be integrated with and viewed as a subdivision of your company’s CRM solution. Aside from having the ability to conduct many of your marketing functions all in one place, marketing automation systems are great for testing, tracking, and analyzing your existing strategies and keeping your marketing and sales efforts aligned. There are a number of marketing automation solutions out there today, including the big names, such as Hubspot, Marketo, Eloqua, and Pardot. Each solution comes with different functionality and features with varying price points, so it is important to know your objectives beforehand and select the solution that caters best to your business needs. Probably the most utilized component is the email marketing functionality. Like most email marketing solutions, you can send out your communications and see how your target audience interacts. But marketing automation allows you to take this channel to a whole new level. Take your company newsletter, for example. Your newsletter includes three different product headlines. By monitoring the newsletter activity you can determine who opens and clicks (and who doesn’t) the newsletter content and which topics are of most interest to your audience. This not only signals an opportunity to further engage with your clients and prospects about a specific product or service offering, but also provides important information about your content marketing strategy. On the other hand, let’s say one of the three newsletter headlines doesn’t get any click-through activity, this should signal a red flag. How do you figure out what the root problem is? Was it a headline issue? Location or format of the newsletter? Or is your content underwhelming and not of interest to your audience? The only way to truly address the problem is by testing…and more testing. Change the headline, reformat the newsletter, modify the content and segment your list into batches. Send the revised versions to your different batches and see which has better results. This is a process that many marketers use and refer to as A/B testing. Another great feature and a widely used email marketing strategy is drip marketing. Drip marketing is a series of prepared emails that are sent out based on prospect activities. With targeted content and pre-defined rules and schedule, prospects are nurtured with relevant content on a regular basis without having to do much manual work. For example, you are promoting a new product or service offering. You set a rule “If prospect visits web page 5 times then add prospect to drip campaign”. Once your prospect meets the criteria he/she will automatically be added into a drip email program about that specific offering. The prospect will begin to receive regular communications, thus educating and nurturing your prospect through the drip campaign and helping them move onto the next phase in the sales cycle. You can set up rules within your drip program too, such as “If prospect clicks X number of emails, notify sales team to conduct a follow up call”. Through these trigger-based rules and activities, your marketing process is much more automated to ensure that you don’t miss out on any opportunities. This just scratches the surface of what marketing automation software can do. Some of the other key features are web site visitor tracking and web form integration, landing page creation, integration with your ad campaigns, WebEx, social networks and advanced prospect segmentation and tagging capabilities. The product will replace your marketing team. Just because you implemented marketing automation does not mean it will do the work for you. The software still requires close monitoring and updating, but if set up properly can make your department an even greater asset to your organization. Too small of a company for marketing automation. The smaller, the better in some cases. Stretching resources is a priority for businesses with limited employees or funds, and segmenting your marketing efforts while automating them will save you time. Market is too B2C. Everyone is a consumer at their core. By interacting with your prospects, it will help you to anticipate their questions. Answer them before they even ask, so you’re always one step ahead. It will be interesting to see the direction in which marketing automation goes in the future. All signs point toward the programs with greater intelligent platforms and more functionality that take individual trends and create self-sufficient marketing campaigns, which subsequently would save you even more time and money. Marketing is just one area of your business that can benefit from an automated solution. If you are interested in improving your business processes and workflow, please fill out the form below. We're happy to discuss how we can help take your systems to the next level. 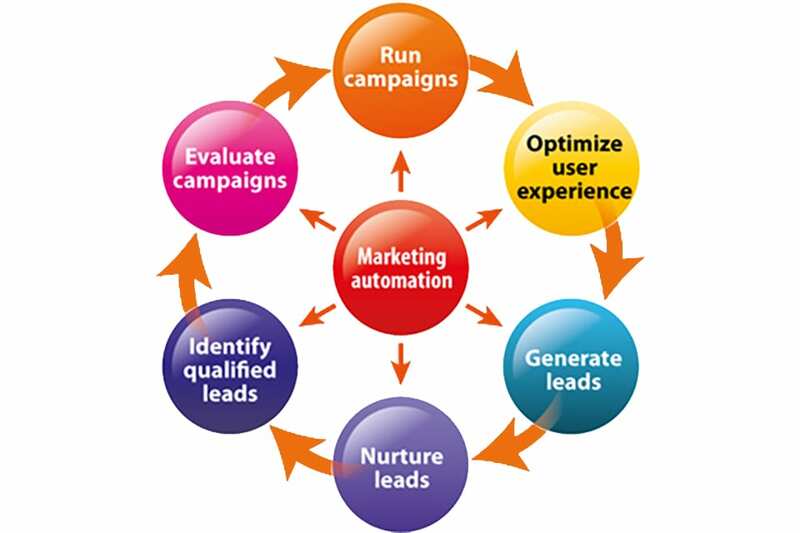 Marketing automation systems are robust tools that centralize your marketing processes and cut back on the manual tasks needed to effectively manage, execute and track your marketing programs and performance. Typically, most marketing automation software can be integrated with and viewed as a subdivision of your company’s CRM solution.